Shown below is a free printable Florida State Road Map. This map depicts the U.S. state of Florida. It shows freeways, roadways, waterways, and Florida cities, large and small. 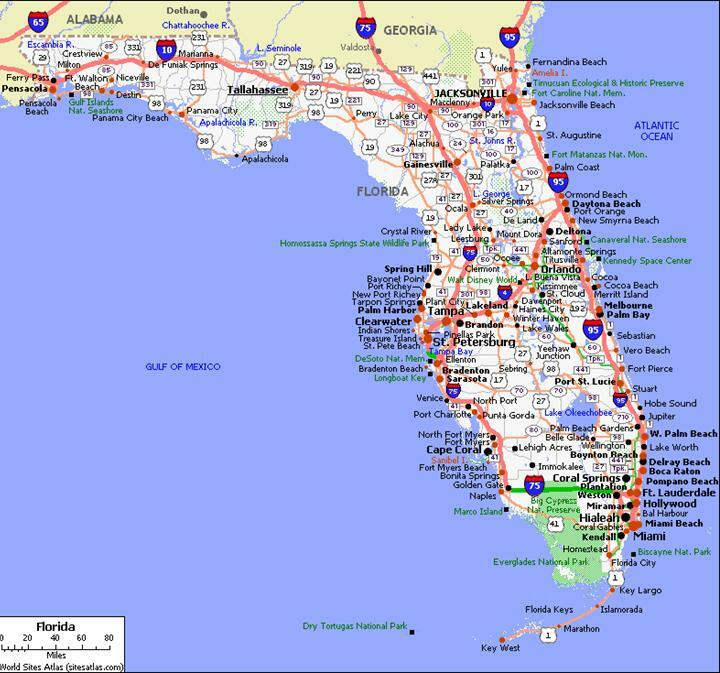 Florida's freeway system contains 1,473 miles of Interstate highways. Florida's four Interstates are the I-4, I-10, I-75 and I-95. The state also has nearly ten thousand miles of local highways, most of them visible on a Florida State Road Map. Most of the state of Florida is comprised of a peninsula located between the Gulf of Mexico and the Atlantic Ocean. Still, a large part of the state extends northwest into a long panhandle. Florida is bordered on the north and northwest by Georgia and Alabama. Florida is not far from several Caribbean countries such as Cuba and the Bahamas. With 67 counties and 20 Metro areas, Florida has the 4th highest state population in the United States. According to U.S. Census Bureau statistics, Florida had a population of about 18,500,000 as of 2010. Florida's largest cities are Jacksonville, Miami, Tampa, St. Petersburg, Hialeah, Orlando, Fort Lauderdale, Tallahassee and Cape Coral, in that order. Some of Florida's most popular tourist attractions are the Everglades (an ecosystem found only in Florida), the Disney World theme park in Orlando, Butterfly World in Coconut Grove and the beaches of Miami. The state also features several beautifully landscaped State Parks and lush botanical gardens. The land that is now known as Florida was originally inhabited by the Miccosukee and Seminole tribes. Popular activities in the state of Florida include cruises, recreational water sports, Spring Break parties and major professional sporting events. To print the Florida State Road Map image shown above, just right click on it and select a save option from your drop down menu. This will send the image to your picture file for future use. From there you can reduce or enlarge it as needed for best printed results. For Florida Universities, Florida photo galleries, Florida work-from-home strategies, and cheap Florida car insurance, visit any of the links shown below. Click Here to view fascinating Fact and Photo Galleries from All 50 States.